Well what a great couple of spring days we had on the water. We've had a few offshore charters this spring. If the fishing was as good as the weather, we would still be cleaning fish, but we still did alright considering it`s still September. The real offshore fishing charters begin in October, November and through to the end of the school holidays, at least. Down west was still quiet, as it is this time of year, but we picked up a couple of small Gummys in 16 meters near the Grange. We then we headed out to the back reef offshore, and picked up a dozen pinky's. Not much size in them, the biggest would have been 33cm. Never the less, these fish are best to eat, so no complaints here. The bar was calm with only a bit of tide wash when it was running out, but the crossing was textbook, no problems. But be careful, this Entrance can change in a few hours, so when you return it may not be the same as when you went out. Always wear your PFD`S because if something does go wrong, you will at least float, and other vessels will be able to see you. Well until next time Happy Fishing, and if you're after an Offshore Fishing Charter of a lifetime, then give us a call or drop us an email. Here at Far Out Fishing Charters we're gearing up for the summer season of off shore fishing. Spring has presented us with the usual wild, windy weather off shore, so we're sitting pretty until it calms down. All our gear is primed, the boat is pristine, and we're really looking forward to getting out to those fishing grounds again. If you would like to book an off shore fishing charter, please visit the Booking page and make an enquiry. We will reply promptly. Welcome to Far Out Charters. This is my first entry in the blog since launching our new website. My intention is to keep you up-to-date on what's happening out on the fishing grounds offshore from Lakes Entrance. We do a lot of offshore fishing charters from Lakes Entrance, thus our knowlege is pretty extensive and thorough. From time to time i'll remember to take some pictures of successful Charters, and give you an idea of what size and species we're dealing with off shore here in Lakes. 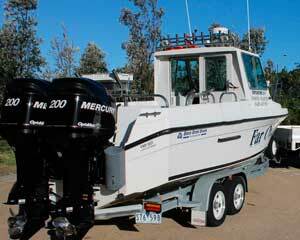 Two new outboards have just been fitted to Far Out Charters. A pair of 200hp Optimax Mercury outboards makes sure we don't waste time travelling to my favourite spots. The weather is just beginning to warm up again, with the ocean currents changing and preparing for the summer months to come. Make sure you don't miss out on some great fun and an unforgettable time out on the water.